Archives are primary sources. They are evidence of human activity, worthy of long-term preservation. They come in various formats and media including paper records, electronic records (e.g. on computer disks), maps, plans, photographs, drawings, sound recordings and film. Would you like to deposit Archives with us? While the present system of local government dates largely from a parliamentary act of 1898, there were earlier local authorities with long histories. Many of their archives have survived. Sligo Borough Corporation was established by a charter of King James I in 1613. The corporation consisted of a provost and twelve burgesses. The borough elected two members to the Irish parliament until the Act of Union (1800). 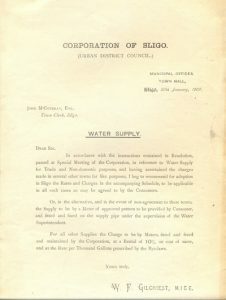 After the 1840 Municipal Corporations (Ireland) Act, Sligo was one of only ten corporations remaining in Ireland. The borough council was abolished in 2014. Other items from c.1840 onwards. Grand Juries were established by the Anglo-Normans and, originally, were involved only in the administration of justice. The high sheriff in a county called twenty-three landowners together twice annually (Lent and summer) to consider cases and refer them to court for trial. In the seventeenth century, their remit was widened to include projects such as the building and repair of roads, bridges, courthouses and gaols. A tax known as cess was raised to fund the works. In the mid-eighteenth century, the practice of holding presentment sessions began. People would propose works for the jury’s approval and it would recommend them to the judge. 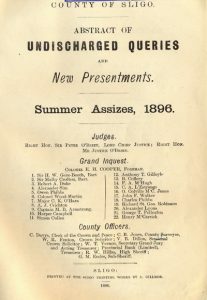 With the establishment of county councils in 1899, the Grand Juries lost their functions in relation to infrastructure, but retained their judicial role. ‘abstracts of presentments’ from 1809 onwards, with some gaps, covering the ‘county at large’ and some of the baronies. The Poor Law was extended to Ireland in 1838, with the division of the country into poor law unions, each served by a workhouse. A board of guardians administered the union and workhouse. It consisted of two types of member: those elected by ratepayers and those who were ex-officio. 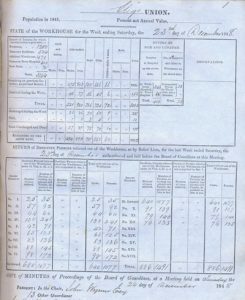 The board set a rate each year for each electoral division that reflected the numbers of ‘inmates’ in the workhouse from that division. In the early 1920s, the workhouses were replaced by county homes under amalgamation schemes. The minute books of the board meetings provide statistics on the number of inmates at the time of each meeting, and detail the matters discussed and decisions reached. County Sligo had three poor law unions: Sligo, Tubbercurry and Dromore West. The Local Government (Ireland) Act (1898) created a new system of County, Urban District and Rural District Councils. The first councils were generally elected in 1899. The Grand Juries lost all of their administrative functions at that point. County Councils were given a variety of functions, with more being added in succeeding years including road building and maintenance; the registration of vehicles and licensing of drivers; housing; planning; and sanitary services. 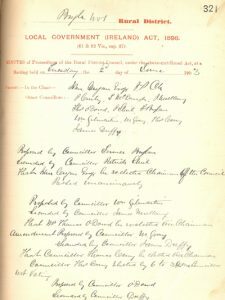 There are extensive archives of Sligo County Council, most of which are as yet unprocessed. Minutes exist from 1899. Rural District Councils replaced the boards of guardians as sanitary authorities in rural areas and they were also responsible for housing. Councillors served as ex officio guardians. These councils were abolished in 1925 soon after the end of the poor law system. There were four RDCs in Sligo: Sligo, Tubbercurry, Dromore West and Boyle No. 1. Sligo Harbour Commissioners were established as a local authority in the nineteenth century. Their powers were enhanced by an act of parliament of 1877. The commissioners were abolished in 2006 and their functions passed to Sligo County Council.